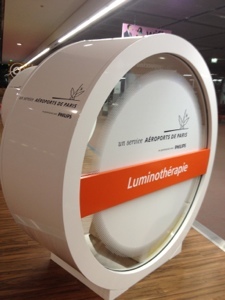 The good people of CDG have provide some light therapy booths - all free - where you can help to reset your body clock by exposing yourself to intense light. Bonus: the seats are comfy too. 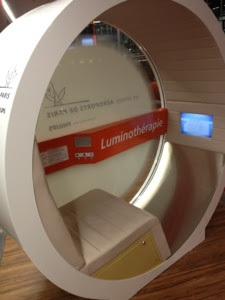 Just beside these booths of light are some strange beasts ... which on closer inspection turned out to be - not dinosaur sculptures - but oddly comfortable loungers. 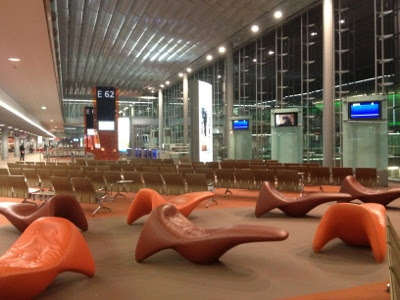 They are redesigning the terminal, but hopefully that will result in more of these gifts to weary travellers, not fewer. The strange amoebic dinosaur chairs are quite similar to your fainting couch - did they suffice?